Our metal roof materials are ideal for homes and businesses throughout South Carolina. They can help to reduce your energy costs by keeping your attic cool thus minimizing your need for air in the hot summer months. And being able to endure wind gusts at speeds of as much as 120 mph, a metal roof is strong and durable enough to endure tropical storms and other weather hazards. 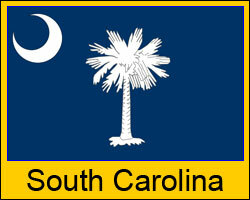 Have your metal roofing supplies delivered directly to your South Carolina work site. Simply contact our customer service team to get started. Our qualified staff is here to help you with your order from start to finish. We offer an array of colors and styles to meet your personal taste and budget. Visit our price list for added product information. Some shipping restrictions or additional charges may apply. We serve Charleston, Columbia, Greenville, Myrtle Beach, Rock Hill, Aiken and every South Carolina town and community in between! Why metal roofing in South Carolina? Most of our products come with an extended, 30 to 50 year manufacturer’s warranty. Environmentally friendly – our products are made predominantly using recycled metals. Energy efficient; many of our styles qualify for the Energy Star tax credit. Metal roofing is more lightweight than most other roofing materials including asphalt shingles. Want prices? Go to our design and price center and get prices now!